At 10 megawatts, it’s bigger than many of the utility-scale systems that have come online this year. The system, supplied by IHI Energy Storage, sits behind the meter at a large petrochemical facility. 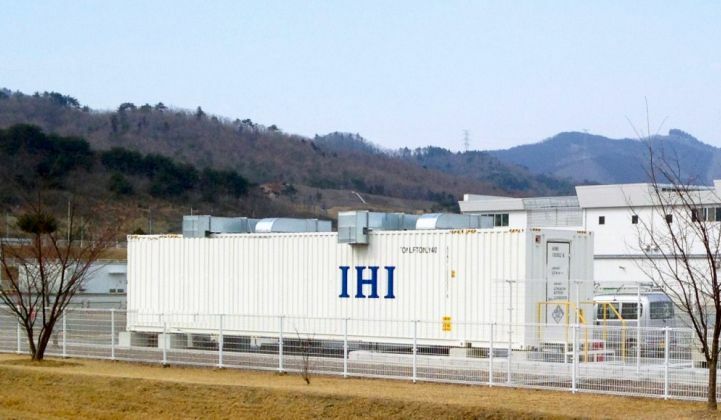 Usually, as a definitional matter, utility-scale energy storage facilities are larger than commercial and industrial projects, which in turn exceed the size of residential batteries. The battery system that developer and owner Convergent commissioned for a commercial customer in Sarnia, Ontario last week upends that hierarchy by matching two utility-scale storage projects for the largest power capacity built in North America this year. The 10-megawatt/20-megawatt-hour system, supplied by IHI Energy Storage, sits behind the meter at a large petrochemical facility in order to reduce its Global Adjustment charge, which the Ontario government assesses based on consumption during the five hours of peak system demand in a year. The project delivers a sorely needed reminder that California isn’t the only market that can support C&I storage, and portends a more ambitious era of customer-sited systems to come. The last project to claim the largest behind-the-meter title was a 2.5-megawatt/15-megawatt-hour project Advanced Microgrid Solutions built for the Irvine Ranch Water District. Ontario’s Global Adjustment charge represents a demand-management opportunity on steroids. U.S. commercial storage, almost entirely within California so far, typically focuses on reducing a customer’s monthly peak to diminish a demand charge. In Ontario, the storage device must accurately predict the provincewide system peak for five hours in the year, and reduce the customer’s load during those hours. “Ontario’s demand charges are bigger than anywhere else,” said Frank Genova, chief operating and chief financial officer at Convergent. Sizing the system required a Goldilocks-like effort to get things just right. But increasing storage duration like that adds cost and burdens the project economics. Ultimately, IHI and Convergent decided on a 2-hour system as the best payback given current lithium-ion pricing. That’s a lot of firepower for a company’s private use. Convergent declined to name the customer, but Genova said it had a load north of 50 megawatts. He also noted that Global Adjustment can make up to 70 percent of a large industrial customer's electricity bill. That means a big pot of potential bill savings — and the storage industry is starting to take notice. Convergent entered the Ontario storage market in 2014 and had 16 megawatts installed before this latest project. Commercial storage specialist Stem also has targeted this market for expansion and raised a CAD $200 million financing facility from the Ontario Teachers’ Pension Plan in July to support its effort. IHI is seeing a lot of interest in Ontario from storage developers, Nishio noted. It’s not easy convincing a large industrial customer to buy into the relatively newfangled storage concept, especially if almost no one around them has done it. In California, storage startups smoothed the sales process with utility capacity contracts or Self-Generation Incentive Program subsidies. But those aren’t in play in Ontario. Convergent took certain other steps to build trust with its customer. For one thing, it pursues a “buy and hold” strategy for the systems it builds. “Any deal we do with customer, it’s a 10- to 20-year relationship,” Genova said. The company financed the project with its own balance sheet, and packaged the product as a shared savings agreement. “If we don’t create savings, the customer doesn’t pay Convergent anything,” Genova said. Now the onus is on Convergent to catch those five yearly peaks so it can make some money. Developer and customer incentives are aligned. Where’d all the big systems go? The Ontario system upends the historical comparisons between utility-scale and C&I storage. It would appear the latter is ascendant while the former treads water. Behind-the-meter storage outperformed utility-scale on megawatts deployed in Q1 2018. With 16 megawatts for that quarter, the whole utility-scale sector delivered just a few megawatts more than Convergent's new project. Grid-scale storage has reached an awkward transitional state where the success of smaller systems has cleared the way for a cohort of megaprojects with more than 100 megawatts of capacity. “The industry has been relatively quiet since Aliso Canyon, and there's a big gap between the 10-megawatt/40-megawatt-hour systems we've seen installed so far in 2018 and the gigawatt-hour-scale systems planned for only 28 months from now,” said Daniel Finn-Foley, energy storage analyst at Wood Mackenzie Power and Renewables. That gap leaves the industry to face a “steep and sudden” growth curve in everything from financing to supplying and executing the massive projects slated for 2020. “To have full confidence that 2020 is going to be a breakout year for front-of-the-meter energy storage, I'd prefer to see more midsize systems installed today," he added. "But that just isn't happening."